Once upon a time most Parisians hated the Eiffel Tower, imagining that it would start to lean and eventually fall over the Louvre or Notre Dame, smashing them into a pile of pebbles. What’s even worse, the tower used to be painted red. And yellow. It’s much easier to hate it if it’s yellow. 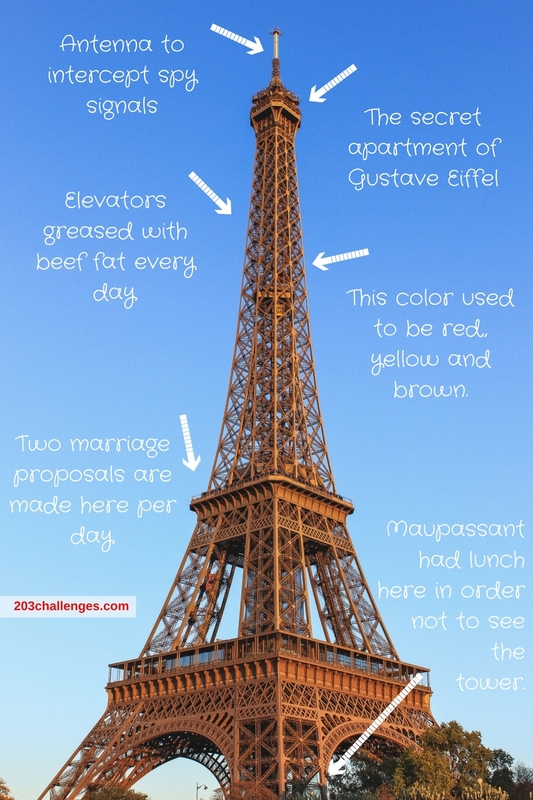 Here are a few more fun facts about the Eiffel Tower to give you a glimpse into some of its secrets. 1. The Eiffel Tower was erected for the World’s Fair in 1889. At the time the buildings of Paris were mostly low, meaning you could see the tower from almost everywhere in the city. Many Parisians, however, weren’t excited about this opportunity, finding the tower ‘useless and monstrous’. Much of the science and art society of Paris, including Alexandre Dumas and Guy de Maupassant, joined the ‘Committee of Three Hundred’ (one member for every meter of the height of the tower) protesting against its ‘ugliness’ and imagining that it would fall over and destroy the most emblematic buildings of the French capital. Maupassant, strangely enough, allegedly had lunch at the restaurant at the base of the tower every day. Why? It was the only place in Paris where he could enjoy a tower-free landscape. 2. It took two years, two months and five days to build the Eiffel Tower. 3. The tower was meant to last for 20 years and then be dismantled. However, it was left standing mainly because of the scientific research taking place there, especially the first radio transmissions broadcast from the antenna at its top. 4. The radio antenna at the top was used to intercept German spy messages during World War II. 5. After sunset, 20,000 lights twinkle from the tower for five minutes, every hour on the hour. 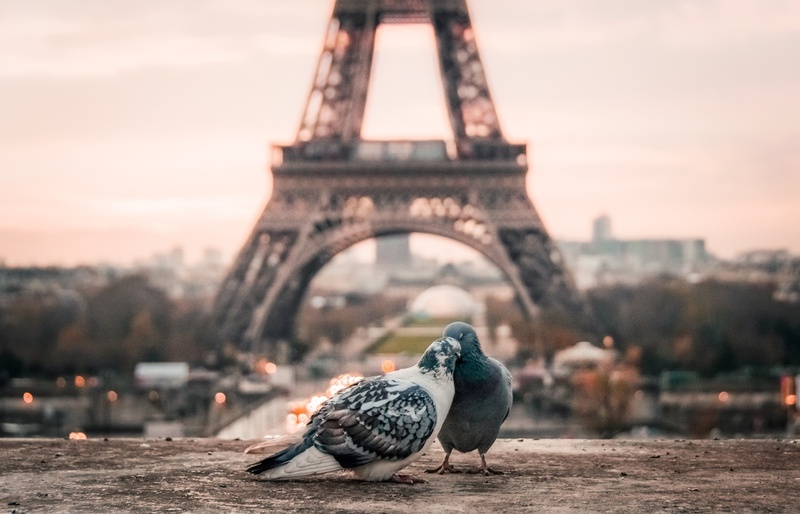 It’s one of the most magical sights you can see in Paris. 6. The Eiffel Tower was the tallest building in the world until 1930, when the Chrysler Building in New York was finished. 7. Gustave Eiffel built himself a secret apartment under the peak of the Eiffel Tower. It remained secret for a very short time, after which he received numerous offers to rent it out for as short a period of time as one night – all of which he firmly declined. He gathered regularly with fellow scientists in the apartment over a drink, or to conduct a new experiment in the small laboratory attached to it. You can now visit the apartment, almost untouched, where the wax figures of Eiffel and his daughter welcome a wax sculpture of American scientist Thomas Edison. 8. Since its inauguration, the Eiffel Tower has been repainted 18 times. It has changed its color several times, being red, yellow and brown in the past. During every repainting, 15 tons of eroded paint are removed, while 60 tons of new paint are applied. 9. The elevators of the Eiffel Tower are greased every day. With beef fat. 10. The lines at the Eiffel Tower are as notorious as the tower is famous. There are, however, a few ways to skip them and magically find yourself far ahead of the crowds. You can buy tickets for the tower up to two moths in advance from its official website here. You can book a table at one of the restaurants located in the tower – 58 Tour Eiffel or Le Jules Verne. A lunch or dinner with a view will cost between 45 and 230 euro per dish. You can climb the stairs – 330 to reach the first level, 670 to the second. From there, you will wait just a few minutes for the elevator to the top. The stairway ticket costs only 7 euros. 11. Le Jules Verne restaurant plays host to an average of two marriage proposals per day.